Soundice is a music player application accessible via web browser. Soundice is for people that listen to music in their homes, at work or ones that don’t have time, to find, what’s the most popular music all over the world. When you get bored, you can always create your own playlist having access to the biggest music library and share it on facebook, twitter or share just the link. 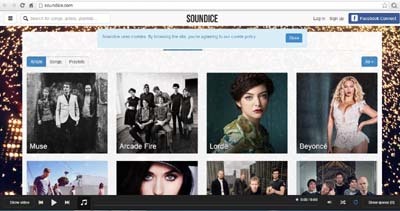 You can use Soundice absolutely for free, without any limits and in-ads. It has already made radio chart playlists and also gives you a way to create your own.